We may have only been following the Duchess of Sussex's wardrobe choices for a short time. However, in the space of just over a year, Meghan Markle has fast become a source of style inspiration for many, with a number of items worn by the newlywed either totally selling out or sparking a number of high-street imitations. Of the most memorable sellouts are Markle's handbags. The East/West shoulder bag by Strathberry flew off the virtual shelves at lightning speed, as did the striking monochrome crossbody by Oroton. It seems the duchess clearly has an eye for accessories. 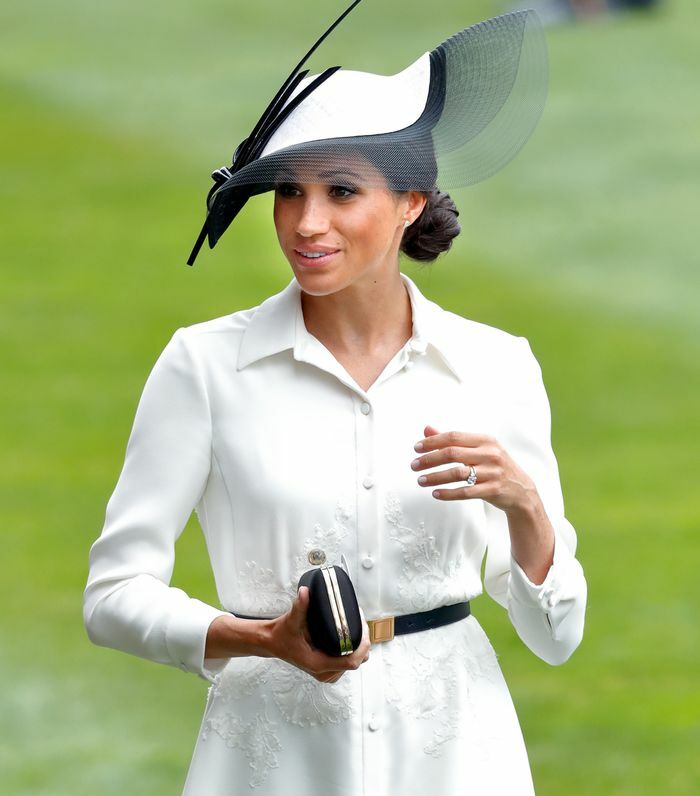 Whether it's a trip to the Royal Ascot, a casual outing with close friends to watch polo or a solo date with the queen, Meghan Markle is rarely seen without a must-have handbag. Her most worn and go-to styles seem to be small, black and of the clutch-bag variety. No real surprises here—we've long been fans of the versatile LBC, and we applaud her for choosing the timeless option over statement-making alternatives. This is closely followed by a versatile crossbody bag worn over a boxy blazer or midi dress. And that's not the only reason we're big fans of Markle's accessory choices. She regularly switches up her designer pieces, opting for the occasional mid-priced label and looking every bit as chic—proving that you don't need to part with serious cash to get your hands on a standout bag. To celebrate the duchess' impressive handbag collection, we've charted our favourite looks below. Scroll to see and shop her bags. Style Notes: Attending the Royal Ascot, the duchess wore a white shirtdress by Clare Waight Keller for Givenchy and monochrome accessories. She finished off the look with a jewel-topped Givenchy clutch bag. Style Notes: Whilst standing alongside the queen on a recent trip to Cheshire, Markle chose a Givenchy pouch to complement her cape-style ivory dress. Pouch-style clutch bags are ideal for wedding season. Style Notes: At the Anzac Day services, Markle wore a textured two-piece by British designer Emilia Wickstead. Here, she teamed her structured look with a modern, gold-edged Jimmy Choo box clutch. This also comes in red. Style Notes: Just days after the royal couple tied the knot in front of millions, Markle stepped out for her first royal engagement in a tonal satin clutch bag and a dress by Goat. Looking for something versatile? Stick to blush hues and simple shapes. Style Notes: How best to offset a black formfitting midi dress? Markle chose a slim waist belt and a seriously chic mini Gucci bag. Wear this on the shoulder or tuck in the chain and style it as a clutch. You'll wear this on repeat. Style Notes: It seems Markle is a fan of monochrome accessories, and we don't blame her. Take your styling cue from the duchess and experiment with different patterns, textures and stripes. Meghan Markle's Oroton crossbody bag has since totally sold out, but you can still get your hands on this equally chic tote iteration (it's also just gone on sale). Style Notes: Proving less is definitely more. Here, Markle teamed a cream Amanda Wakeley tailored coat with a navy Springsteen dress, completing the ultra-elegant outfit with navy Manolo Blahnik shoes and a Mulberry Darley bag. Swap your black shoulder bag for something small and navy from Mulberry. Style Notes: Markle took a break from graphic monochrome tones and opted to complement her forest green midi skirt with a top-handle tote bag. After huge demand, Charlotte Elizabeth has restocked the Chestnut Bloomsbury bag, which can now be personalised with your initials. Style Notes: What to wear with an oversized Burberry checked winter coat? A chain-strap Strathberry bag in a matching green hue, of course. Sadly for us, the green style has since completely sold out, but we're also into this berry hue (and it's currently still in stock). Style Notes: Markle turned to luxury accessory designer Wilbur & Gussie for the ultimate metallic clutch bag. The Edith bag is the perfect clutch size, and it comes in a rainbow of shades. Style Notes: Spotted attending a Christmas Day service, Markle confirmed the circular Pixie to be the Chloé bag of choice. She teamed her designer bag with a belted Sentaler coat and suede Stuart Weitzman over-the-knee boots. Now you too can dress like a royal.